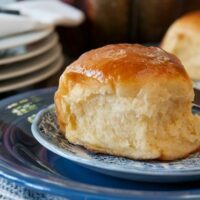 Sweet Potato Dinner Rolls with Honey Butter Glaze are light and fluffy dinner rolls made with a small amount of sweet potatoes added to the dough and baked with a honey-butter glaze on top. 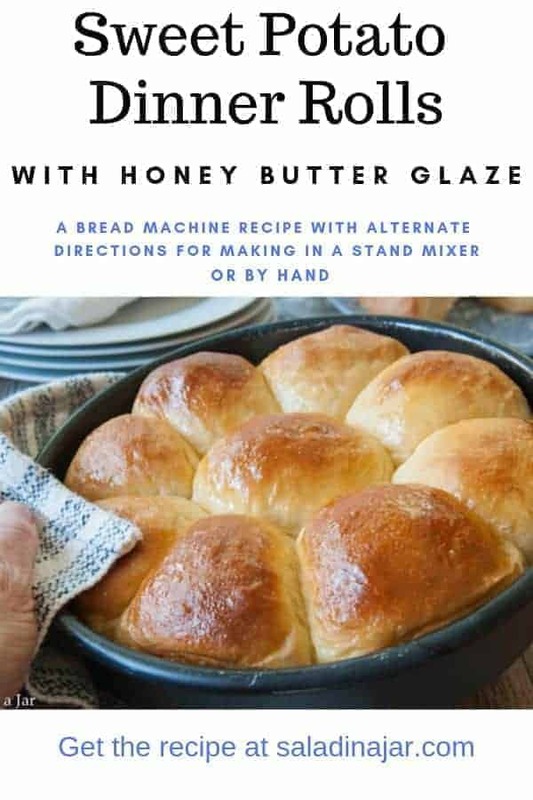 Although the recipe is written to be mixed and kneaded in a bread machine, you can do it by hand or use a stand mixer. See directions end the notes at the end of the recipe. 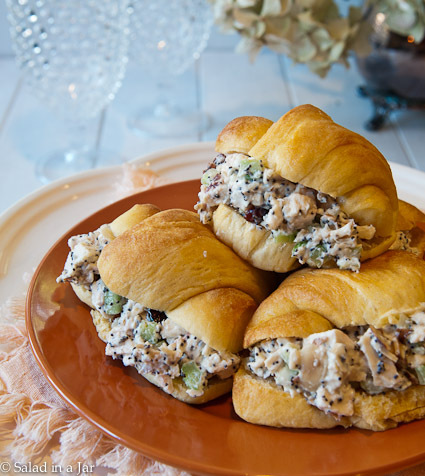 These rolls are on our Thanksgiving menu…and I can’t wait! The secret to their tenderness, Hawaiian-bread-like color, and lasting freshness, is the sweet potatoes. Don’t worry. No one will ever guess it because you can’t taste the potatoes. Check out this video to see how to make perfectly round rolls. Make them into balls or go all fancy and make crescents. 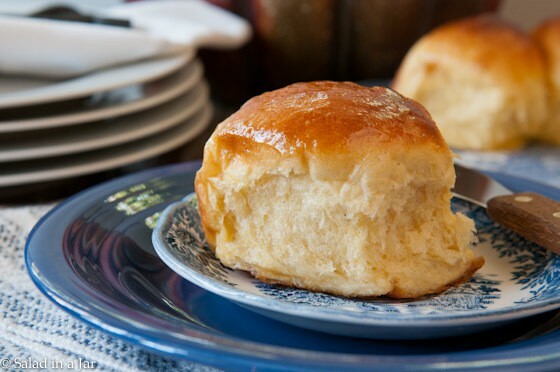 The sticky sweetness of the honey butter glaze makes these rolls completely irresistible. However, I recommend glazing only those you think will be eaten straight out of the oven as they will become even stickier after sitting a few hours. Sugar attracts moisture. A quick pass of butter when hot out of the oven, or just plain naked still makes a scrumptious roll. And one more thing. That dash of cinnamon called for in the recipe? It’s optional but I implore you to try it. Your tastebuds won’t be able to call it by name, but they will recognize something special. It all just goes together. 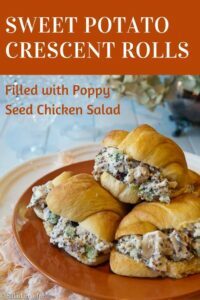 IF… you have any leftover rolls, they make perfect slider buns or containers for my Poppy Seed Chicken Salad. Better make a bunch if that’s your plan because it’s easy to eat a whole pan of these without even realizing it. 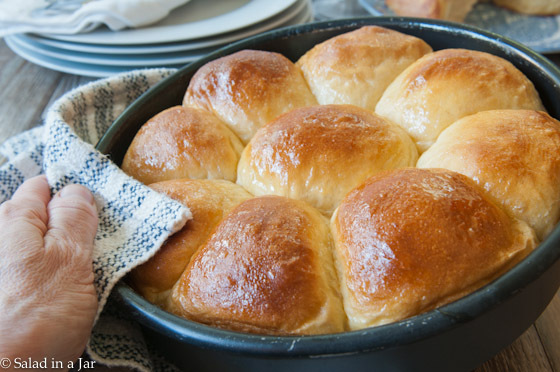 Light and fluffy dinner rolls made with sweet potatoes and baked with a honey-butter glaze. Great slider buns without glaze. 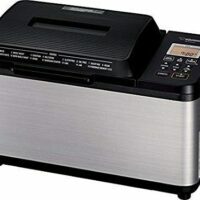 Add ingredients listed to bread machine pan in order listed. 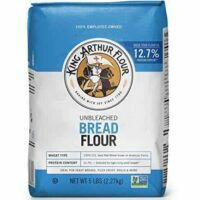 Remove dough from bread machine to floured surface. See below to form dough into shape of your choice. Cover with a tea towel. After rolls have almost doubled in size, brush with honey butter glaze, if using. Bake at 350 degrees F for 12-15 minutes or until rolls are golden brown. Divide dough in half, then half again making four sections. Divide each of these sections into 4 pieces of dough which should leave you with 16 little doughballs. Form into round balls. Arrange balls into two round (or square) 8 or 9-inch greased pans. Cover rolls loosely with tea towel to rise. Divide dough in half and form each half into a ball. Roll to approximately 10 inches in diameter. Use a knife or pizza cutter to create 8 triangles (see picture). 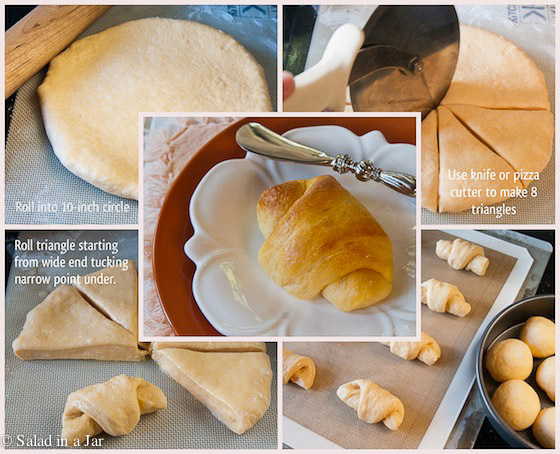 Roll each triangle starting from the wide end and finally, tucking small end under so it will not pop out when baked. Place on greased cookie sheet. Combine all ingredients and brush carefully over each roll just before popping them in the preheated oven. Try not to let the glaze touch the cookie sheet. Boil or bake fresh sweet potatoes, or reserve 1/2 cup portions from your leftover Thanksgiving sweet potato casserole as long as it hasn't been adulterated by extras like pineapple or other fruit. Just be sure the sweet potatoes are mashed to a silky smooth texture so they won't be recognized in the rolls. Help! I Forgot To Add the Yeast. Can This Bread Dough Be Saved? Thank you Paula! These rolls are wonderful! i was too lazy to cook potatoes so i used pumpkin pure instead. By the end of the day only one roll was lef. i am glad i found your site! I’m so glad you wrote. I have never tried pumpkin in these rolls but figured it would probably work. Good to know! Thanks for writing. 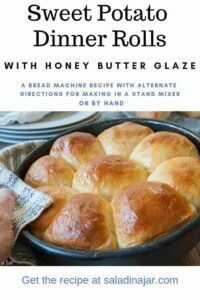 Can I save the leftover glaze to use in 3 days? Doing a test run on these rolls today and will be making them again on Thansgiving. I haven’t tried it but I would think so–as long as you keep it in a sealed container so it won’t dry out. I found this site about yams against sweet potatoes. Is it accurate, i would not want to buy the wrong stuff? I’m afraid I don’t really know. I buy whatever is available in my local grocery store and it has always turned out just fine. Made these rolls and really enjoyed them! I liked them best as a dinner roll. I made them in the morning so I skipped the glaze and warmed them up for dinner, so delicious! Thanks for taking the time to come back and give your opinion. This dough also makes wonderful cinnamon rolls. I just made some yesterday. I made these in the bread machine today (they are rising right now). The dough was very, very sticky. Is that how it turns out for you, Paula? I added an extra 1/2 cup of flour, and it was still very difficult to shape the rolls. Oh no. The dough should not be sticky. It should be VERY easy to handle. I wonder if you miscounted the cups of flour (I’ve done that), or….is it possible you mis-measured the liquid ingredients? Were your sweet potatoes runny? They should be the consistency of rather thick mashed potatoes. Anyway, you did the right thing by adding more flour but sounds like you should have added even more. Did you use bleached flour? If so, you must use more than if you use the bread flour called for in the recipe. This is a mystery and I’m not sure of the answer without watching you make them. I make bread in the machine several times a week at least, so I’m pretty familiar with the process. I think the liquid measuring was good. It is possible that I miscounted the flour. As I recall, I had to open a new bag, so maybe that was the problem. I do use bread flour. Also, I baked the sweet potato in foil, and it may have had a high moisture content (it seemed fairly juicy when I peeled it). Thanks for responding…I’ll try them again. I think your sweet potato should have been perfect. Perhaps it was the flour. Makes sense. I just saw the comment about how to make them if you don’t have a bread machine. I just used my Kitchen aid. I had to use approx. 1 extra cup of flour because the dough was very sticky. I then took the dough out of the bowl with floured hands kneaded a little more flour into the dough so it wouldn’t stick to my fingers, formed it into a dough ball, greased my bowl put the dough back in the bowl and turned it over so it would have the oil on both sides of the dough. I covered the bowl and let it set until it had probably doubled in size. I than punched it down and divided it like the recipe said. I put in in 2 cake pans, covered them with a tea towel and let them rise again till double in size. I then baked them as your recipe suggested and they turned out wonderful. Hope this helps with those who want to know how to do this without a bread machine. Paula, thanks for posting your experience for us. Did you follow the recipe exactly with your Kitchen Aid or did you have to add extra flour as Peggy did. Also did you sift your flour prior to measuring? Thanks and I pray that God blesses you with a speedy recovery. I’d like to make these this weekend to have with lasagna! I’m wondering if they can be assembled ahead of time and baked just before dinner. If so, at what stage should they be refrigerated? Thanks! I would recommend chilling them after you have formed them into rolls. You’ll need to allow an extra 1-2 hours (depending on the temperature of your room) for them to double before you bake them. Hope that helps. Thanks! I’ll let you know how it goes – I’m making them tomorrow! Yum, Paula, I could probably eat a whole panful of these – quite delish looking! I need to come watch you up close make those round dough balls, mine don’t come out as perfect as yours! It’s looks delicious. Thanks for the post. These sound delicious, but I don’t have a bread machine. Can they be made without it? If so, how? Thanks! Yes, I am confident they could be made by hand or with a stand mixer but I have not actually done it myself so can’t give you specific instructions. 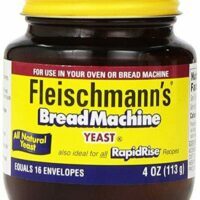 You might google how to convert a bread machine recipe to get started.